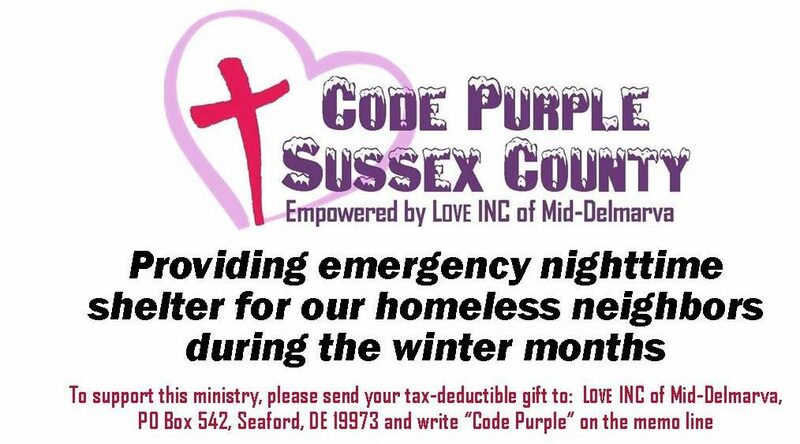 Code Purple Sussex County does not make phone calls requesting donations to businesses or to the public in general. We post our needs on our website and Facebook page. Sometimes a board member may request a specific item, such as restaurants partnering with our shelters to provide meals but we will not call on businesses to donate items to us. If at any time you receive a request for donation and it is not from a board member or on official letterhead please contact our Executive Director Nikki Gonzalez at 302-519-0024 or our Donations Coordinator Teresa Shockley at 302-381-8792. Anyone wishing to donate much needed items please see our needs list and drop off at the below locations or to St. Luke’s Parish House in Seaford or Avenue UMC in Milford anytime between 7pm and 9pm. Our shelters are open nightly till March 12th, 2017. We are a very fluid shelter and see many different guests come in nightly and the supplies go quickly so please consider making a donation, especially food donations, paper products like bowls, cups (hot & cold), plates, and plastic ware. We are also always in need of drinks, coffee, sugar, creamer, underwear (male & female), gloves, long johns, winter boots, and jeans! Please call Teresa Shockley at 302-381-8792 if you wish to know more about the items the shelters are in need of! St. Luke’s Parish House, Gateway Fellowship, and Avenue UMC shelters will be open nightly from January 1st to March 12th, 2017. Day Center: Rehoboth CRC open to the homeless on Tuesdays and Wednesdays for showers, laundry, and job finding assistance from 10am to 2pm. Call 302-227-1340 with any questions. Volunteer with Code Purple Sussex County! We can’t help our homeless without Volunteers! We need you to serve in order to keep our shelters open. You can find our online volunteer form here: Online Volunteer Registration Form. We have an online calendar to make signing up easier. Signup.com Code Purple Sussex County Online Calendar. Code Purple Sussex County will be open every night from January 1st, 2017 to March 12th, 2017 to eliminate the weather variable. After March 12th, 2017 we will return to calling Code Purple for 32 degrees and below. Please sign up to do In-Take, bring dinner, or stay overnight at one of our shelters. Share the news with your church, civic organization, and with your friends and family. We really need overnight volunteers. Avenue UMC, St Luke’s Parish House Shelter, and Gateway Fellowship slots are ready to be filled! Please sign up today! Any volunteer questions please call Tammi Kauffman at 302-242-8076, any dinner, online calendar, or website questions please call Vikki Prettyman at 302-853-0997 or email us at sussexcountycodepurple@gmail.com. Milford: Avenue United Methodist Church, 20 N Church Street, Milford, DE. Call Nikki Gonzalez at 302-519-0024. Men ONLY in-take at 7pm. Dinner served at 7:30pm. Day Center: Rehoboth CRC open to the homeless during the day 302-227-1340.